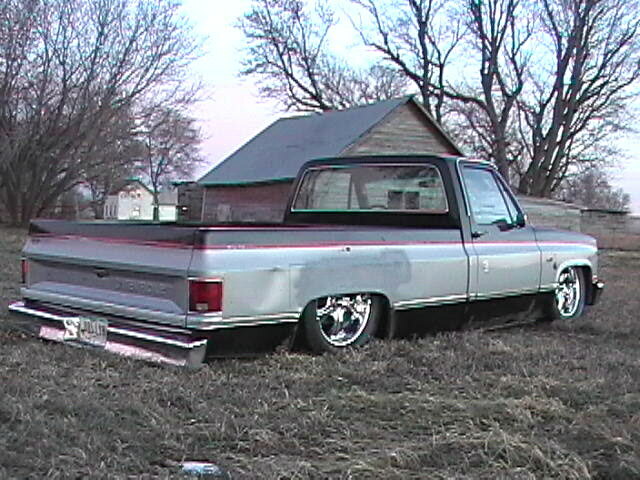 This is my 84 Chevy Silverado project. I got it at a local dealership for $900 becuase they said it needed a "flywheel". Well, first of all, it's an automatic, so it uses a flexplate. So, I bought a TranStar flexplate at work, and figured, while I'm at it, I will get a starter too. I bought a Hitachi PSL100 gear reduction starter also. I went to replace the flexplate, and they had put a stagered mount starter and shimmed ONE bolt, so it was grinding like the flexplate was junk. 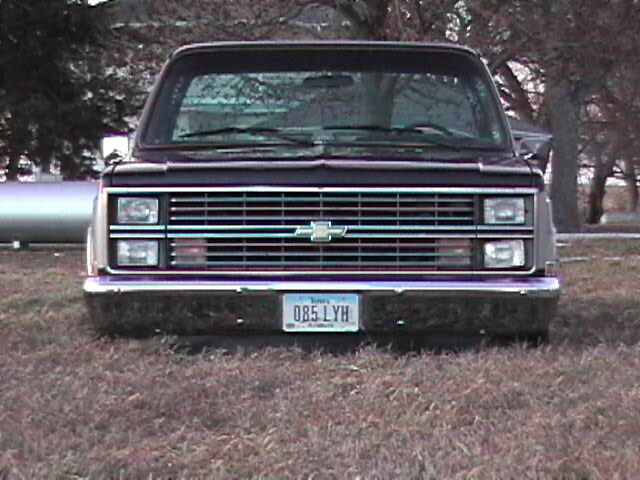 It had a 305 in it, and a dual exhuast with a couple 40 series Flowmasters, so it sounded alright once I got it running. I drove it around for about 4 months when I decided to air-bag it. 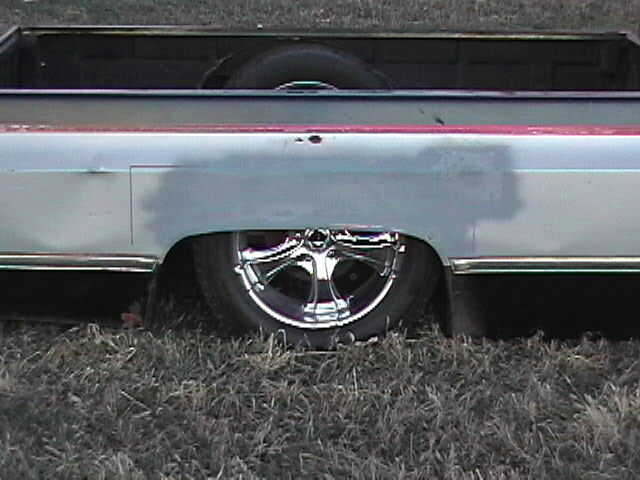 Now I'm not a fan of 30 series sidewalls by anymeans. I think it looks like crap. While I was notching the rear frame for the axle, I went to one of the tire shops in Sioux City and asked if they had any used 20's so I could mount two tires and wheels and get my clearances set up. They had some 305/55/20's, probably off of an SUV or something, so I bought 2 of those for $50 a piece. After I finished the air-bagging process, I drove it for about 2 months. It wasnt low enough. 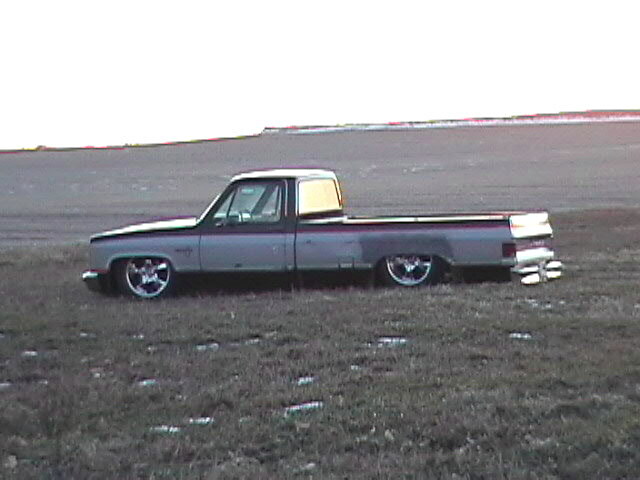 The front sat higher than the rear, becuase the tire was hitting the firewall. Back to the garage. I bought 2 trailer fenders at the local MidWest Wheel, and welded them together width-wise, so I had a very wide fender. This is what I used to tub the firewall. I had to completely remove the A/C system from the passenger side to make room for the tires. I have done more to it, check out the frame Z page for fun pictures and info.